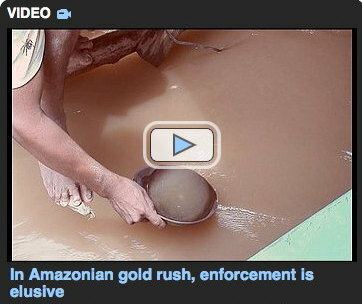 The price of gold has drawn miners into Madre de Dios, a department of southeastern Peru. But deforestation and use of mercury in the mining have created an environmental hazard for the surrounding rainforest. The Peruvian government is trying to crack down, by enforcement is difficult in the vast jungle of the Amazon. "This is all we have here now," said Mauro Javier Gómez, 23, who drives a truck hauling sediment out of the Huepetuhe mines. He was born here; his father migrated down from the high Andes. "This place is a beach. Nothing grows. Gold is the only thing we know how to do."